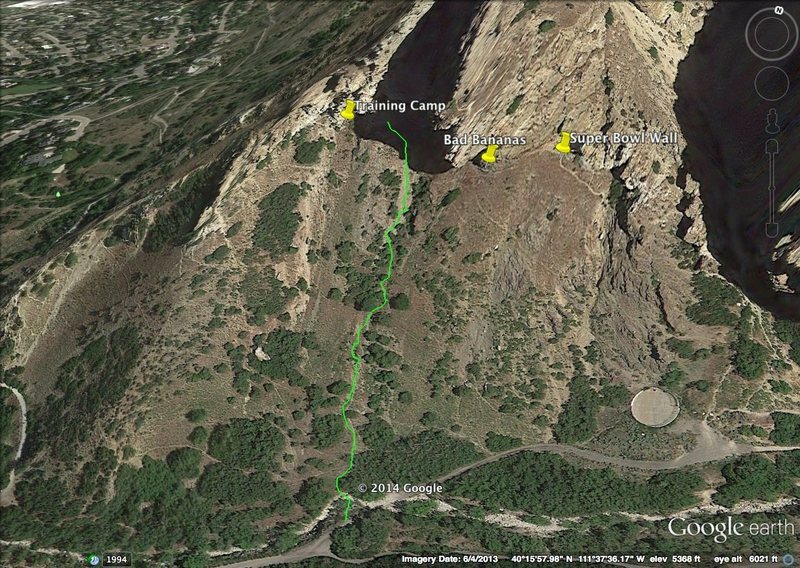 The Training Camp comprises the various buttresses and outcroppings on the north side at the mouth of the canyon. It lies above the mostly grass-covered steep slope that runs down to the creek bed. The rock described by this area lies to the west of the very large, tall buttress that contains Bad Bananas and Super Bowl Wall. The rock consists of a layer of crumbly, shattered, white quartzite topped with outcroppings of harder, better-quality reddish and yellowish quartzite. The lower, shattered layer is sort of a necessary evil; slog through it to get to the better rock above. As of early 2008 route development is active and ongoing. The easiest approach is as for Super Bowl Wall and Bad Bananas. Continue west along the base of the rock following the sheep trails. It is possible to approach more directly, but it is a miserable slog and leads to more erosion. Slacklining at the Training Camp, April 13, 2008.